[AR-15] What Does AR Stand For in AR-15? Follow us as we go over what it doesn’t stand for…plus what is exactly an AR firearm and our favorite picks. Or if we already answered your question…how about The Complete AR-15 Guide or our Beginner’s Guide to Guns? 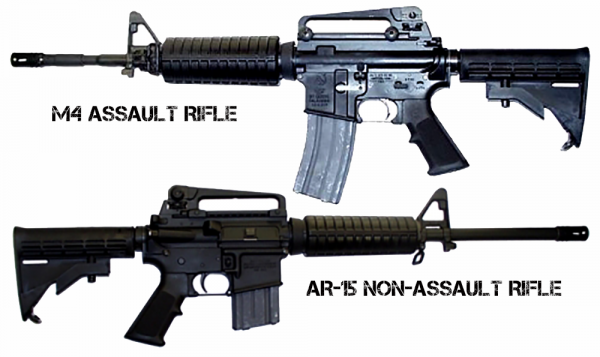 A common misconception is that AR stands for “assault rifle,” but that’s not the case. And no, it doesn’t stand for “automatic rifle” either. For the record, the way states legally define “assault rifles” varies dramatically between states, and journalists have a tendency to basically use “scary looking” as their definition or to act like there’s not a standardized definition at all. The easiest definition is that an assault rifle lets you choose between semi-automatic and fully-automatic modes of fire. It has an effective range of at least 300 meters (330 yards). Rifles like the AR-15, which is widely cited as an example of an assault rifle, fundamentally fail to meet this definition in that they don’t have selective fire capabilities – they can’t be set to shoot automatically as well as semi-automatically. Only one trigger press = one shot. Furthermore, new fully automatic firearms have been banned in the United States since the Firearm Owners’ Protection Act of 1986, and they aren’t easy to get ahold of illegally for anyone except well-connected career criminals. Ones produced before the ban are still legal, but they command a high cost (think tens of thousands of dollars) and are closely monitored by the ATF. So What Does AR Stand For? In reality, AR stands for ArmaLite rifle. ArmaLite is the company that originated the design for the AR style of rifle back in the 1950s. And while we’re decoding ARs, the number simply refers to the model number of the rifle, not to a barrel length, capacity, or anything else. The first widely produced AR rifle was the AR-5, a .22 Hornet survival rifle. It was adopted by the US Air Force as the MA-1 Survival Rifle. Shortly after, the AR-7, the semi-automatic civilian version of the AR-5, was released, chambered for .22 LR. Both of these guns are still produced today by several companies, including a takedown version of the AR-7 produced by Henry Repeating Arms. In the 1950s ArmaLite began designing and producing the AR-10 (shooting the larger 7.62×51) in small numbers, and in the following decade started producing what is probably the most well known of the AR series of rifles, the AR-15. Colt now owns production rights for both the AR-10 and AR-15. Learn more in AR-10 vs AR-15. Next ArmaLite began production on the less expensive AR-16, and AR-17 shotgun and a smaller AR-18 to meet a variety of different needs, but by the 1970s the company ceased rifle production and in 1983 closed completely. 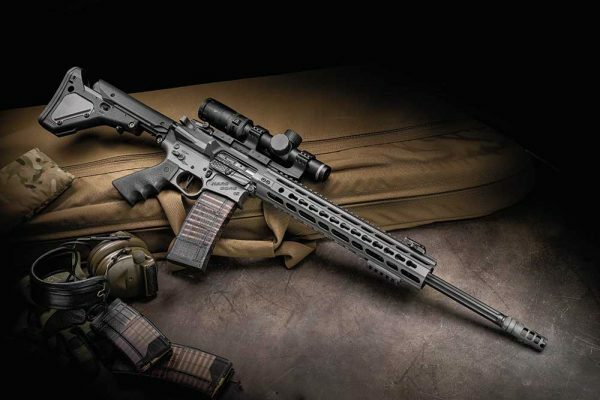 In 1996 rights to the Armalite company were sold and rifle development and production resumed, leading to the introduction of the AR-10, AR-20, AR-50, and more. In 2013 the company was again sold, this time to Strategic Armory Corps, who also owns AWC Silencers, Surgeon Rifles, Nexus Ammo, and McMillan Firearms. Now going forward you know better than to believe people who say that ARs are all assault rifles, and you know what an assault rifle actually is. Want to learn more? 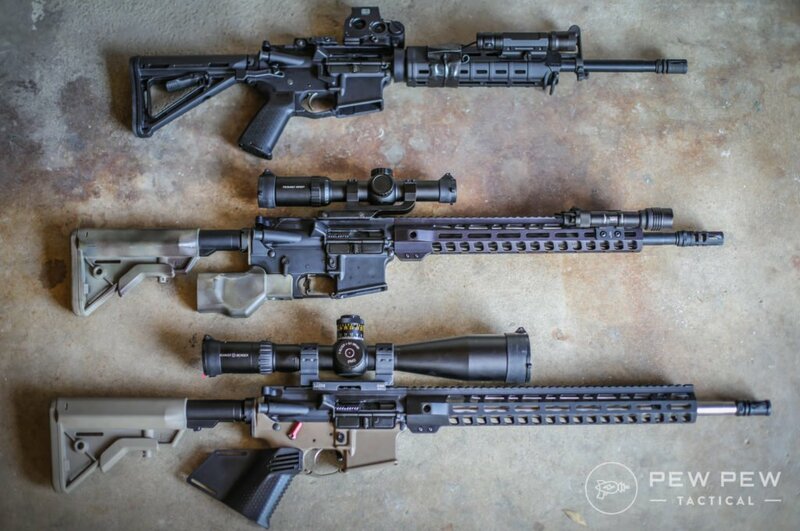 Check out our Definitive AR-15 Resource or straight to The Best AR-15s. Or if you want to start with handguns…check out our Beginner Handgun Course. What other misinformation surrounding firearms you like to see set straight? What questions do you have that you would like answered? Let us know in the comments. If I have an AR15 and use it only to protect my family and my life does the name change from asualt rifle to ” defense rifle ” ?? Yes, tell Nancy Pelosi, but she wouldn’t listen, right? I know there is a move to call them Modern Sporting Rifles, but I would love for the designation to be changed to HDR = Home Defense Rifle or Homeland Defense Rifle exactly in keeping with the 2nd A ! If the Dem get back into power might be good idea and time for a change. the right of the people to keep and bear arms, shall not be infringed. (infringed – limited or undermined) pretty straightforward even for this obtuse person. Did you know that prisons are built keep bad people inside. They are god at keeping wild eyed gun crazed bezerkers out. Should all public places be built like prisons ?? Limiting the magazine size would help. Nobody needs 30 rounds to hunt Game. We have rules on how many cartilages can be in some hunting weapons. Why not just make it a law that saids how many rounds a gun holds. I am not referring to Military.weapons. Never hunted jack rabbits huh!..? The capacity of the magazine is not the problem, neither is the gun. It’s the users intent and state of mind! There’s cartilage in hunting weapons? Wouldn’t bone be a stronger material to work with? OH! I just re-read your post. You’re not talking about “Militaryweapons”. Of course. cartilages for hunting weapons, bone for military. SMH. WE don’t need Ric Young squawking about that which he has no clue either, but yet, HERE HE IS!! I’ll keep my drum mags, stripper clips and whatever else I desire.